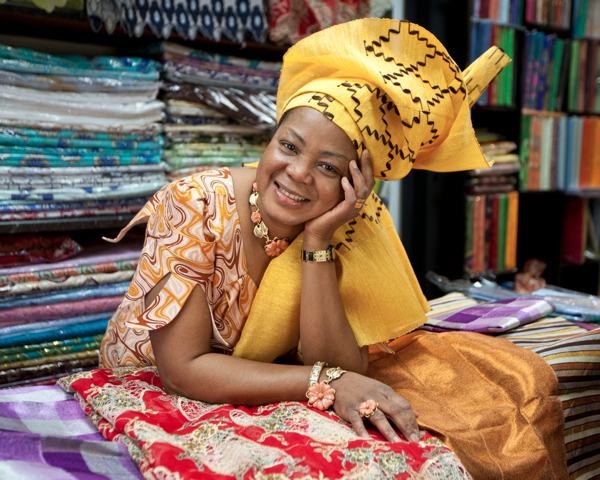 On a rainy Sunday in Spitalfields when everything is grey, I wend my way to Wentworth St to visit the African textile stores, that glow like multicoloured lanterns illuminated in the dusk – where a troupe of magnificent women preside, each one a shining goddess in her own universe. A radiance which Spitalfields Life contributing photographer Jeremy Freedman celebrates in his exuberant portraits published here. Sunday is when it all happens in Wentworth St, when customers coming from as far as away as Aberdeen and the Netherlands converge to savour its wonders as the international destination for the best Holland Wax, French Lace, Swiss Voile and Headties to be found anywhere. Weaving through the Petticoat Lane Market and pausing in the drizzle to gaze into the shop windows, you will spy the fine ladies of Wentworth St holding court in their shops to the assembled throng, simultaneously displaying the wit of matriarchs, the authority of monarchs and the glamour of movie-stars, and all dressed up to show off the potential of their textiles. Identified upon the fascias by their first names, as Franceskka Fabrics, Tayo Fashions & Textiles, and Fola Textile, many of these women put themselves forward personally as bold trendsetters, designing their own fabrics, defining the fashion and styling their customers too. In this, the oldest part of Spitalfields, the textile industry which has defined this neighbourhood for centuries is alive and thriving today thanks to the talents of these shrewd businesswomen of Wentworth St.
Undeterred, Franceskka bravely opened her shop in the Kingsland Rd – at a respectable distance – and, fourteen years ago, she was one of the very first to open in Wentworth St, thus initiating this extraordinary phenomenon where now every other shop here sells Wax, all fiercely competing with their own styles and prices. Thankfully, Franceskka is still in one piece and, in reward for her courage, she is a big success. 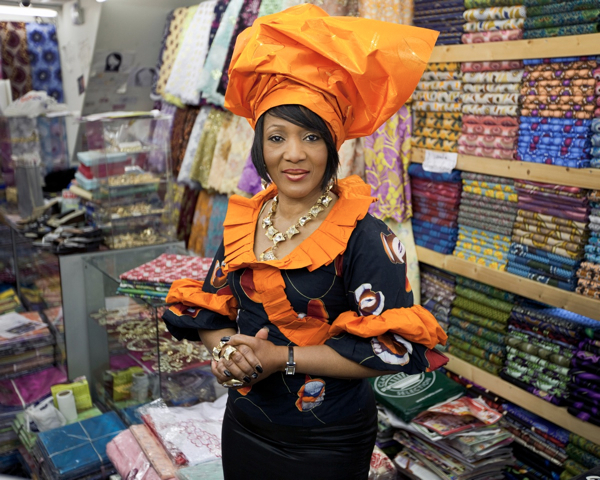 “Lots of Nigerian women came at first to buy and ask advice,” she revealed delightedly, “but then women from Gambia, Senegal, Sierra Leone, Zimbabwe and Ghana came too. 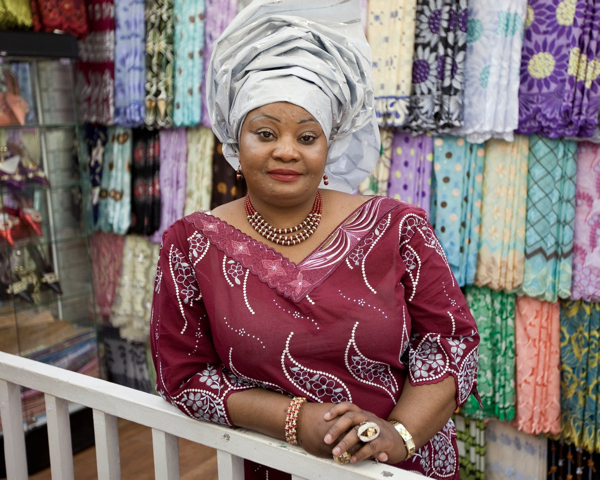 Many didn’t know how to tie the headtie so I teach them how to do it.” With an unassuming relaxed presence, Franceskka, who has a Post Graduate Diploma in Business Studies, controls her international business empire from this tiny shop, extending to two more in Lagos and a third in Abuja. “I go to the fabric exhibitions in Paris and Spain to get inspiration, I design the fabrics myself and get them manufactured in Switzerland. The French Laces are in vogue at the moment and they are very expensive, but if it’s for a wedding people will go all out to look beautiful.” she said, with a delicate smile and lift of her brow, merely hinting at the razzle-dazzle on offer. Banke Adetoro at Royal Fashions incarnates the notion of sassy with her extravagant eyelashes, constantly fluttering like butterflies. “There’s nothing you want that you can’t get here,” she informed me with an amused gesture of unqualified authority, when I dropped in, “I get all the latest stuff. I can do as many as twenty buying trips in a year. My shop is the biggest and the most beautiful!” You really need to visit this shop to experience the vast phantasmagoria of patterns on display. 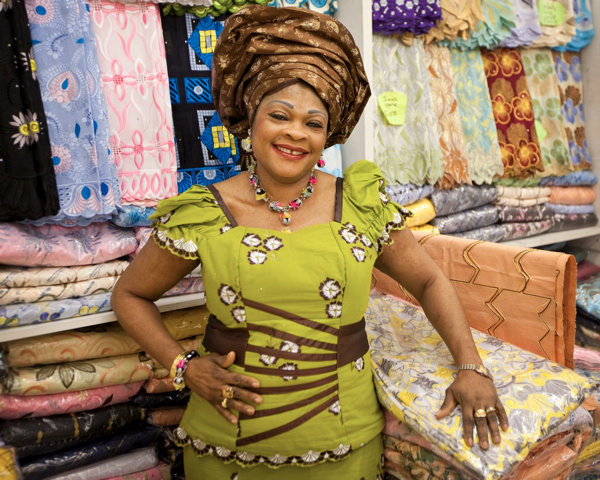 By contrast, across the road at Tayo Fashions & Textiles, I met the alluring Tayo herself in her modestly-sized shop. “My mother used to do this back in Africa, and I picked it up,” she confided to me quietly, “I just started trading at home and through the church, and then I started in a small shop with a little help from the bank. 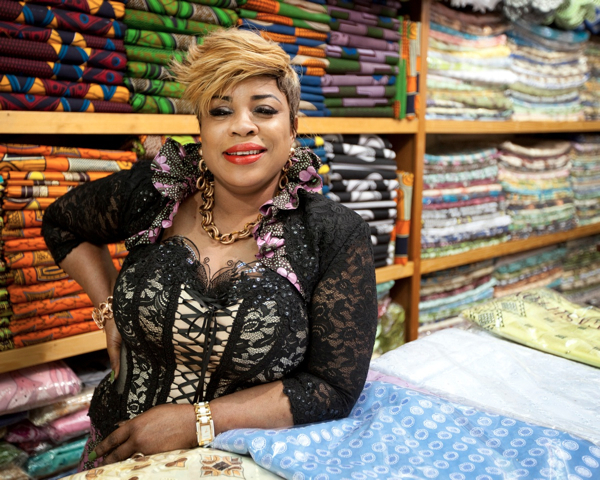 Now I have a shop in Lagos too and I go three times a year.” Outlining the convenient balance between the trade in both continents, “At Christmas it’s busy there when it’s quiet here, and it’s busy here in the Summer when it’s quiet there.” she said. Tayo’s two sons help her out in the shop and I was fascinated that in every single shop I visited these women had their children present. In fact, most had come into it through their families and some already had their children working with them, and I found it an interesting contrast to the perceived dilemma between children and career that many European women face. 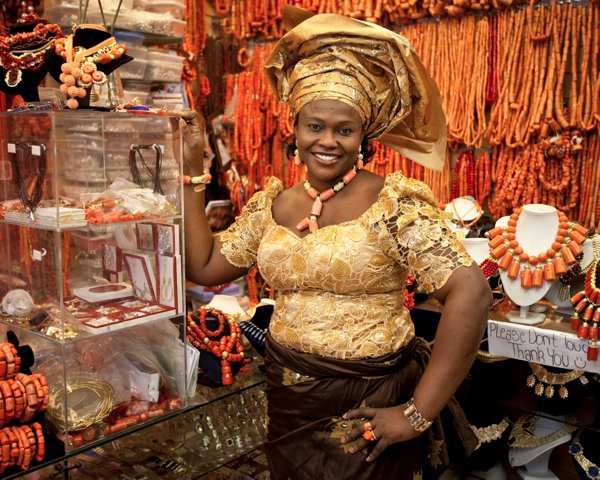 Speaking with the Wax sellers of Wentworth St, who taught me the Yoruba concept of “Aso- Ebi” – using co-ordinated textiles at a social gathering to express the inter-relationships of all the people there – I realised that these modest shops contain an entire cultural universe with its own sophisticated language spoken in the vocabulary of textiles. Fashion exists here but, more than this, each decision taken, both in the choice and combination of fabrics makes a personal statement, which gives every single outfit a vibrant poetry all of its own. With grateful thanks to Sheba Eferoghene for making the introductions. i think this must be what women in heaven wear on their heads. wonderful to see this again. They are goddesses, reminded me of Brixton Market in the 70′s.